Healthy Snack Wednesday – Guest Post & Recipes by One Fit Foodie! 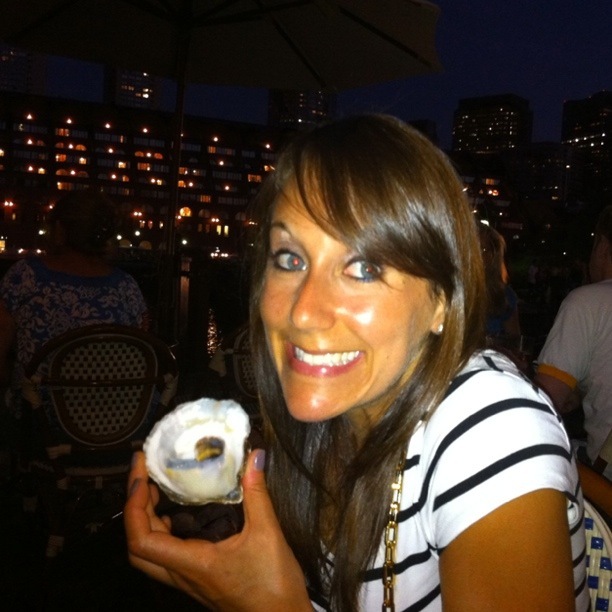 My guest poster this week is Naomi, who writes the blog One Fit Foodie. I mean, the name says it all, doesn’t it? Do I REALLY need to explain why I asked her to guest post on a Healthy Snack Wednesday? Naomi is constantly tweeting great exercise routines, and protein packed recipe ideas…Its like she was born for this guest post! Happy reading! I first want to introduce myself for those who don’t know me. I am Naomi and I write the blog, Onefitfoodie. I have a BS in exercise science. I am also an ACSM certified personal trainer as well as hold my AFAA group fitness and spinning certifications as well. In addition, I compete in fitness competitions! You can say I’m a bit of a health nut! Of course I am all about balance and moderation and FOOD. Oh gosh I love food. Generally I like to eat 6 smaller meals throughout the day to keep my blood sugar levels stable as well as keep my energy HIGH in the sky! My snacks and meals are a healthy combination of protein, fats and carbs which keep me fueled and energized so i can power through my workouts! I was so excited when Renee asked me write a guest post for her especially having to do with Healthy Snack Wednesdays! On my blog, you will find a whole plethora of healthy and easy recipes, so I am going to give you a glimpse of some favorites that I enjoy quite often. 2.Quinoa/Greek Yogurt Bowl: This is one of my all time favorite combinations. The quinoa is a nutty, protein packed grain and paired with creamy greek yogurt, fresh fruit and cinnamon, it makes for a perfect summertime snack. 3. Low fat Soy Muffins: These are one of my best creations!! They were even featured in Oxygen Magazine, March 2011. The recipe calls for soy flour, banana, applesauce, stevia and lots of other yummy ingredients. They freeze well so you can make a whole batch and just grab and go! They are perfect for pre or post workout as well! 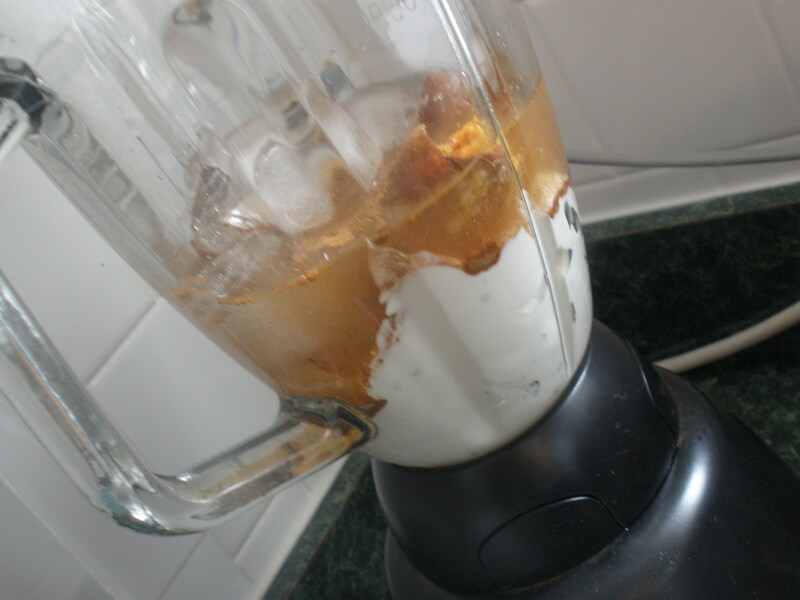 In another bowl, mix together banana, applesauce and almond milk. Add banana mixture to flour mixture and stir until well combined, but do not over mix. 4. 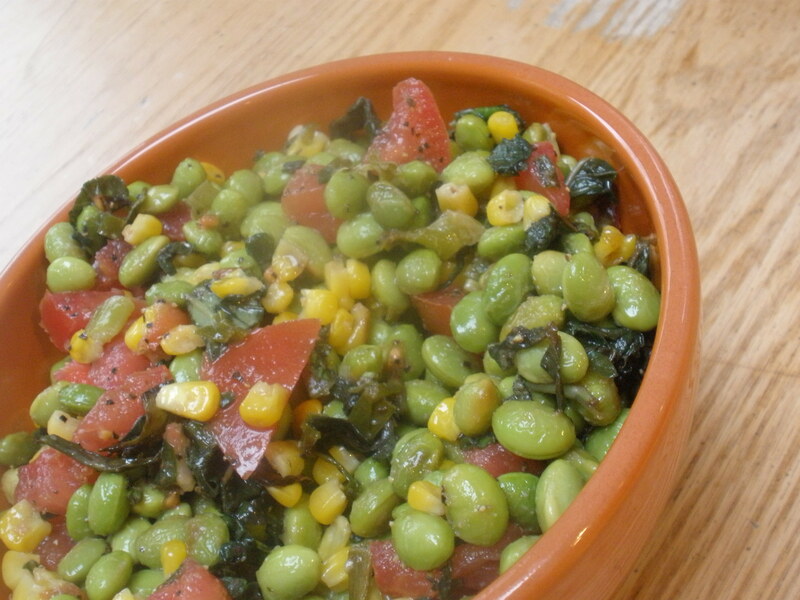 Roasted Corn and Edamame Salad: I made this for mother’s day and it was SUCH a hit! I also loved that it stayed good in the fridge after a few days. It is so summary, light and delicious! Protein from the beans and healthy carbs from the corn make this a perfect addition to your daily snacks! To complete the meal, I would throw in some walnuts or sliced almonds for some healthy fats! Place the edamame, corn, scallion, garlic, olive oil, salt and pepper into a 13 by 9 metal pan and stir to combine. Place on the middle rack of the oven and roast for 10 to 15 minutes, just until the edamame begins to brown. Remove from the oven and place in the refrigerator until completely cool, approximately 30 minutes. Add the tomato, basil and vinegar to the edamame mixture and toss to combine. Taste and adjust seasoning, as desired. Serve chilled or at room temperature. SOME OF MY OTHER QUICK HEALTHY SNACKS! Kale chips (Spray a bunch of kale with EVOO spray and bake kale in oven for 15 minutes at 375 degrees. Top with sea salt and pepper.) I enjoy Kale chips with some sort of protein such as ground turkey or ground beef. Healthy Turkey Meatloaf! CHECK THIS RECIPE OUT SO DELICIOUS! This entry was posted in Recipes and tagged edamame, healthy, healthy snack, healthy snack wednesday, Naomi Rothstein, one fit foodie, protein, quinoa, recipe, shake, side dish, sweet potato, vegetarian, workout by reneeh. Bookmark the permalink. These are great suggestions! Part of why I fell off from my more strict healthy eating program is because I got tired of egg whites, piece of fruit, handful of almonds, etc. I want to try the sweet potato protein shake.